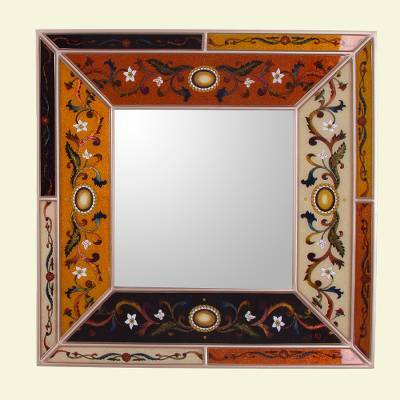 Reverse Painted Glass Mirror with Multicolored Floral Motifs, "Colonial Voyage in Rose Gold"
Multicolored floral medallions are hand-painted to decorate the square frame of an elegant mirror. Working in the colonial style of reverse painted glass, Peruvian artisan Edmundo Contreras creates this mirror. Its frame is crafted of wood, finished with rose gold-tone paint. Edmundo Contreras has received 3 microcredit loans with 0% interest from Kiva and Novica, the first for $1500 and the most recent for $2850. Proceeds were used to buy raw materials such as high quality wood and glass to expand production of his mirrors and jewelry boxes. Edmundo's beautiful craftsmanship and unique designs have helped to grow his Novica sales. This steady income has enabled him to expand his workshop and he regularly gives jobs to other artisans from his community. "My art strives to be a testimony to history and tradition.... One of my proudest moments was receiving the Vizcardo & Guzmán Medal as a master artisan, awarded by the Peruvian Congress." Born in Apurimac in 1965, Edmundo Contreras Aquise works in the andahuaylino (Andahuaylas) style. He uses painted glass and crackled finishes in a technique that is both traditional and modern. His motifs range from the pre-Hispanic, colonial, and ethnic to the beauty and culture of the Andean world and its wildlife. "I inherited my interest in art from my mother, a weaver," he says. "As an adolescent, I enjoyed painting and liked to create cartoons as a form of social protest (when terrorists threatened our land). In this way I represented those difficult moments when students and country people faced danger from two fronts. "I learned a great deal from my companions in a craft workshop taught by Amilcar Andía, a gentleman from Andahuaylas. One of my friends was Juan Quintín, a painter, and another was Reinaldo Rivera, who had graduated from the School of Fine Arts. From them I learned a great deal, and through practice, I discovered more techniques. "My art strives to be a testimony to history and tradition. With the danger of extinction of certain art forms, I represent them in hand-painted wood, glass and ceramic. These take the form of objects that are utilitarian and decorative, such as home furnishings, mirrors, vases and more. "I've exhibited my work at arts and crafts fairs, and in 1995 took first place in the Concurso Internacional para América Latina y el Caribe, winning the UNESCO Prize. One of my proudest moments was receiving the Vizcardo & Guzmán Medal as a master artisan, awarded by the Peruvian Congress in 2002. "My dream is for my art to be known and appreciated outside my country." They are so lovely, and useful. I gifted this beautiful box and I was immediately elevated to star status. It was so well packaged, and was as beautiful in person as on the website. I didn't open it before gifting but I wasn't disappointed. Novica artist do quality work! Mr. Contreras, I was so very, very pleased to purchase this beautiful, reverse glass mirror. This design is lovely with a mixture of flowers and butterflies. Your hand painting truly shows all your talents and you are blessed.